I’ve been on leave from work for 4 days, waiting on the arrival of the newest member of my family. Baby’s due date is (depending on which view you go with) either tomorrow (Jan 18) or Monday (Jan 21). So basically I’m not thinking about this as my annual leave; I’m just sitting on my hands waiting.. and waiting. There are no prizes for guessing that my wife and I are very excited! In the meantime I’ve been keeping myself busy with making some rope/string. 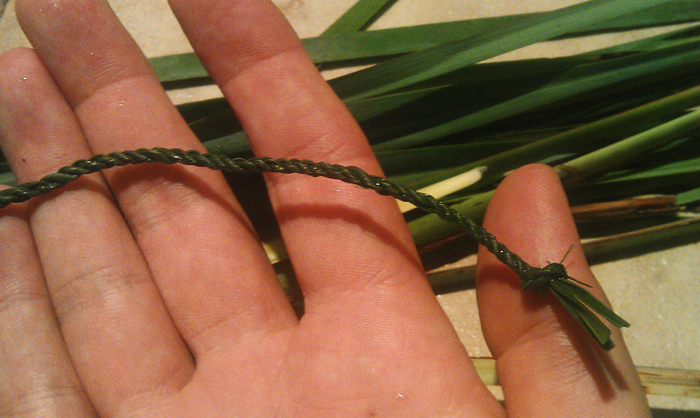 The string is made from Dianella Tasmanica (Tasman Flax Lily). Which is one of two species I favour when rope making, and will also be experimenting with in making fishing line. The other preferred species is Lomandra Longifolia (Spiny-Headed Mat-Rush), which is often used by Koorie women for weaving baskets. Both species grow locally here in Victoria and are commonly found in urban areas, mostly in car parks and on median strips, given that both are quite hardy plants and are low maintenance. As an added bonus the bright blue berries on the Dianella are edible, although there is some conjecture about how much may be readily consumed. So, I personally advise against others trying it at all. So, why the string? One very good reason – it will be used to tie the new born’s umbilical cord off, after it has been cut with a traditional stone-knapped blade (Chert). I stumbled upon this post while researching how to make indigenous string for a uni assignment… and I just wanted to say that this is a fantastic idea! … and thank you for the information!